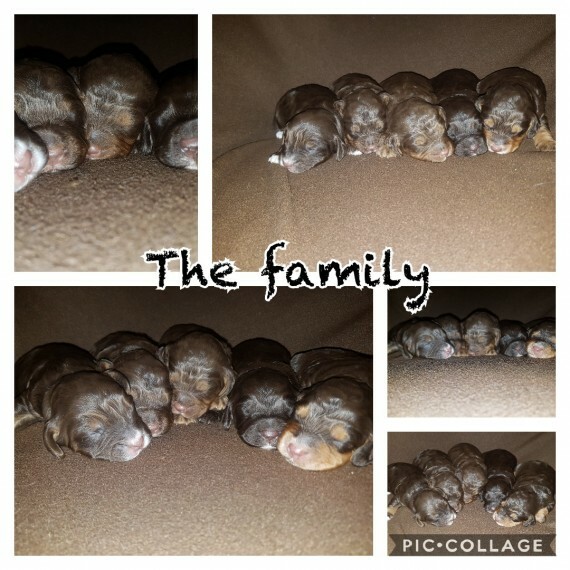 Our lovely fox red kc reg working cocker girl has given birth to 5 healthy beautiful cockapoo baby..s.there are 3 boys and 2 girls . Farther is a lovely kc reg chocolate phantom toy poodle . Both parents are pra prcd clear .our puppys are brought up in our loving family home with 3 children they will be well socialised and use to all house hold noises etc.all puppies will leave for there new forever loving homes with 4 weeks pet insurance 1st vaccination microchip wormed at 2 5 8 weeks and will be seen by our vet for health check and a puppy pack copies of all relevant documents from both parents will be given to each new owner .puppies will be ready to leave to there new homes on the 30.10.2018 at 8 weeks old .a non refundable deposit of .150.00 will secure your puppy .boys are .1000 girls are .1100. Any questions please feel free to get in touch to arrange viewings. 3 x boys now reserved. 2x girls still looking for there forever loving homes.